Make your reservation by e-mail: suebourquin@hotmail.com. For your convenience, we’ve included a form you can use to send the email instead of sending an email manually. When you are planning to attend with a group, please feel free to peruse the menu on the pages and choose one course from each group that will meet the approval of your party. I will be happy to guide your choices for a balanced, well timed meal. Please be cognizant of any food allergies and preferences of all the people in attendance in order to plan properly. While I do not have a liquor license, I will offer a bottle of wine to your group, at no cost, but you are welcome to BYO additional beverages to the offerings of water, and coffee, or tea with your meal. The best leftovers my husband has taken to work! Thanks again for a great night full of information, laughter, wine, and insanely good food! 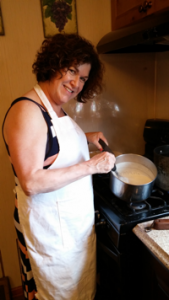 Sue Bourquin makes learning to cook so much fun! I even ran right out and bought the ceramic knives she said were so great…today 4 stitches! I guess I failed! Can’t wait to come back! An incredible afternoon of learning, cooking, friendship, and food! Sue Bourquin is an amazing teacher and chef! Would recommend this experience to anyone. 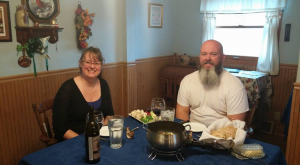 Sue takes great care in sharing her knowledge and love of Italian cuisine. While you select the dishes you will create that session, she will offer helpful suggestion when requested. My fiance and I did this as an educational date night and both walked away content…and with recipes. If you find yourself planning to be in the area….schedule a couple of hours to keep some tummies happy for a lifetime. Thank you so much, Sue! This was so much fun! Would suggest this to all of my friends!!!!!!! Such a fun experience with delicious foods! Learned great tips that I’ve already started sharing with my friends! Of course she’s the best!!!! She taught me her ravioli- better than anyone around! This is a wonderful blend of eating (yum), learning history and techniques, and EATING (yum again). Sue has a deft hand, and makes homemade pasta look easy! Her breads, sauces and overall flavor profiles are exquisite. I loved her lasagna (this from someone who really doesn’t like lasagna) but when you go, I strongly recommend that you get her to make the Panne Cotta. I could easily have eaten 5 helpings! And, it is light and lovely, so you can still eat it if you’ve eaten a bit more than you should have.. It’s a great time, and will be a fun event for friends to enjoy together! The education was inspirational; the company, delightful; the food, divine. Everything was wonderful !! Nonna is a marvelous cook and even went to Italy to be able to share more knowledge with us. Dinner was great and I have already made her recipe for zucchini fritters. Thank you – thank you – for a delicious meal and a great evening. Amazing afternoon, amazing food. What a great day. And we came home with enough leftovers for at least two more meals. I’d recommend this to anyone who likes to cook. A friend and I took her class and dining experience. We had so much fun! And the recipes we got are now being enjoyed by our families. Can’t wait to do this again! So much fun. Everything was great! Thank you.